This summer when we visited London, we had to visit tower bridge for our son, he knows it as london bridge from his nursery rhymes. 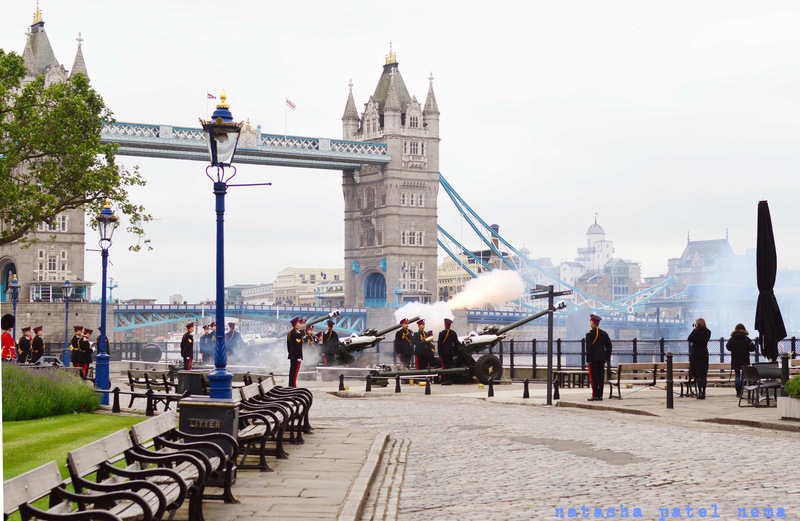 The day we visited it, cannon shots where going to be fired in some honour of the queen. We were standing behind the rope tied for the cannon show. They were going to fire some 60 shots of cannons. As we were waiting I was a bit worried that son would not like the loud shots and he would want us to leave. They had cordoned the whole place around, guards in traditional clothes where moving around, it gave me a feel of old london. Standing there I started imagining old London, imagination was easy as that time I was reading King Lear by Shakespeare. I was thinking how tower bridge and things around it looked and felt in the old ages. I look at my son, whome we had put in his stroller, he was cool as cucumber, no reaction… Cooly looks at me and asks, “Bhoom?”, suddenly I realise this Indian boy loves firecrackers we burst in Diwali, he was enjoying the show.. Some 30 cannons later, I was busy clicking pictures as I wanted the cannon’s orange fire to come in a shot, so I must had literally taken 100 pictures to finally get this one. My photography teacher is right, he says, it is very easy to become a photographer with a digital camera, in times of film they could take only 36 pictures so the precision had to be top noch… Well am I lucky to born in this age? Or does technology hinder in the way of sharpening the saw? Can’t say but I like living in today’s world..
As I was reading Shakespeare that time, quoting these sentences from King Lear, I was reading around these pages in London. Keep a schoolmaster that can teach thy fool to lie. I would fain learn to lie. They’ll have me whipped for speaking true, thou’lt have me whipped for lying, and sometimes I am whipped for holding my peace. Weary of all shall want some. May not an add know when the cart draws the horse? Great post – put me right there! We were in London for the Queen’s June birthday celebration and watched the marching of the guard. It was warm and one of the men standing there fell over, straight as an arrow, on his face. They are not even allowed to crumple. And they left him there.